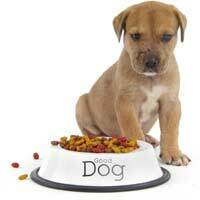 You're getting a new puppy and need to decide what to feed it - a raw diet or a commercial food. Proponents of both diets are very passionate about the benefits of their respective diets. Therefore, it is important to look beyond all this and put your dog's health first. You should also consult with your veterinarian and/or breeder to help determine which diet is best for your dog. And don't forget to research the pros and cons of both diets. The most common raw diet is the BARF diet - Biologically Appropriate Raw Food. "This diet consists of raw meaty bones, vegetables, offal (the organ part of the protein source), recreational bones and proteins like cottage cheese and eggs with the shells," according to I Love Dogs. Along with raw bones and veggies, the raw diet also contains grains. While some of the lower-end commercial foods contain a lot of grains, the raw diet, along with the better commercial food, contain minimal amounts of grains. Grains from prey (their stomach contents) constitute only about 10 per cent of the dog's daily nutrient intake, as they can be very difficult to digest. To put grains into your dog's diet, use raw, organic whole grains. Do not cook the grains in order to soften them up, as they will lose much of their nutritional value. Instead, soak them in filtered water for 24 hours. Fruits and vegetables should be cut, grated and served in small amounts as dogs do not have the ability to digest large amounts of plant food. A good raw diet will also include raw garlic - about ¼ clove is needed for every four pounds of your dog's body weight. Garlic helps to repel fleas as well as controls parasites and worms. Just because you currently feed your dog a commercial food does not mean you are not able to switch him over to a raw diet. The transition must be made gradually as the dog's body needs time to adjust to the raw food. Start by adding small amounts of raw food to his existing food over a few weeks' time. Most dogs, when transitioned properly, enjoy the raw diet and do very well on it. However, generations of breeding have altered dogs greatly from those found in the wild. So if your dog does not like the food or does not appear to thrive on it, discontinue the raw diet and return to his former food.